Coffee and beer come together at Civil Pour (Photo: © Brian Brown/Beer in Big D). 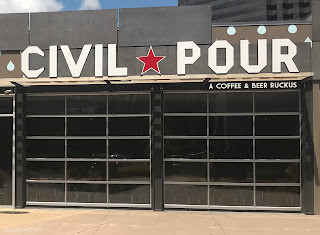 A ruckus is about to be raised, as the specialty coffee shop/craft beer bar known as Civil Pour prepares to open this week in North Dallas. 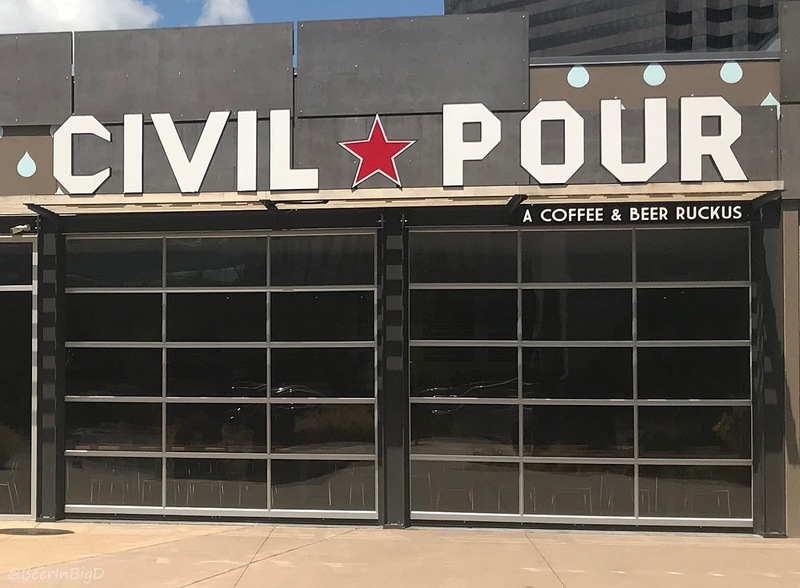 Conceived by Chad and Nellie Montgomery, Civil Pour is the latest venture for a couple most well-known for its work with Big Texas Beer Fest. Billed as "a coffee and beer ruckus," the idea behind the new place is rooted in a play off of the Civil War, where North and South combatants are replaced by coffee and beer. At issue, it seems, is an argument over what makes for a better beverage. To that end, options for coffee lovers at Civil Pour include the signature drip (served by way of the Commuter Cup), shots of espresso and cold-brewed coffee, while beer fanatics can pick from 30 taps containing only the finest in draft-only selections produced by local and national breweries. as a virtual picture window to the outside world (Photos: © Brian Brown/Beer in Big D). So, which is your beverage of choice? Take sides if you must, but who's to say you can't alter your allegiance over the course of a day. Why not grab some coffee on the way to work, and then a beer on the way home? Or vice versa, I suppose, if you're the type that enjoys beer for breakfast. Regardless of whether you stop in to kick-start the day, or unwind after a long one, Civil Pour's carefully-curated selections will be delivered to you within the confines of a bright and welcoming atmosphere. You can even add a pastry pairing to round out a morning snack, or a panini sandwich to make it a meal. Either way, Civil Pour seeks to satisfy all coffee and beer cravings by offering the best of both under one roof. Think of it as a way to ease potential hostilities. Order what you like at Civil Pour...and raise a drink to detente.